When the UFC and FOX fired Chael Sonnen Monday from his analyst duties after flunking a second random drug test in five weeks, the UFC’s official statement regarding the situation seemed so cold. Sonnen had become one of the promotion’s biggest pay-per-view draws in recent years, yet they quickly sided with their broadcast partner in distancing themselves from Sonnen and his cheating ways. 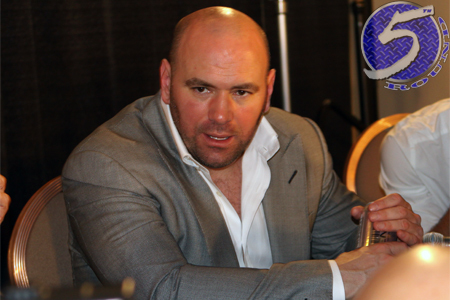 Well, as it turns out, the decision to cut ties with Sonnen was a difficult one for UFC president Dana White (pictured) to make. However, White believes he was left with no choice. Sonnen was slated to fight Vitor Belfort this weekend at UFC 175, but retired after flunking his first random drug screening for Anastrozole and Clomiphene. The 37-year-old later admitted to also taking hCG. On June 17, the NSAC handed Sonnen a temporary suspension for the flunked random exam. However, the commission didn’t get the results back from the second random drug test they had administered on June 5 when the initial ban was levied. That test subsequently showed Sonnen had HGH, EPO and hCG in his system. Sonnen, arguably the best smack talker the UFC has ever seen, has been serving as co-host on Fox Sports 1′s weekly series “UFC Tonight” and is a regular analyst for the UFC’s pre- and post-fight shows.